The Cthulhu Mythos was H.P. Lovecraft’s greatest contribution to supernatural literature: a series of stories that evoked cosmic awe and terror through their accounts of incomprehensibly alien monsters and their horrifying incursions into our world. 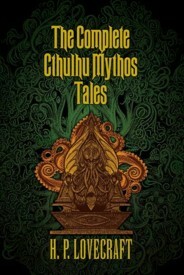 The Complete Cthulhu Mythos Tales collects 23 of Lovecraft’s greatest weird tales, including “The Call of Cthulhu,” “The Colour out of Space,” “The Dunwich Horror,” “The Shadow over Innsmouth,” and “The Shadow out of Time.” It also features six collaborative “revisions” through which Lovecraft expanded the scope of his dark mythology. In these stories, monstrous entities traverse the gulfs of time and space and humankind cowers in fright at the havoc they wreak. The Complete Cthulhu Mythos Tales is your passport to realms of unimaginable horror. The Complete Cthulhu Mythos Tales. By H.P. Lovecraft. New York, NY: Fall River Press; 2013; ISBN 978-1-4351-4780-5; paperback; 608 pages.